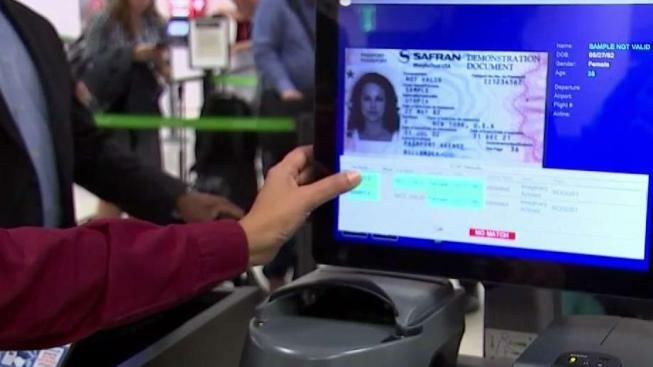 NBC 6's Willard Shepard has an exclusive look into new screening technology and other security measures at MIA. Cutting-edge technology heading to a South Florida airport is going to cut down on the time you spend in line and will make your flight safer. Miami International Airport is one of the first airports to obtain new machine readers that will be at security checkpoints. "We have identified Miami as an innovation airport, which means as we bring in new technology on and we want to test it in the live environment, we bring it down to Miami," said David Pekoske, a retired U.S. Coast Guard Admiral who runs the Transportation Security Administration. At one MIA checkpoint Tuesday, the TSA showed NBC 6 what they say is a better way for agents to identify passengers and their destinations. The new machine readers can take your drivers license or passport and turn it into a wealth of information, including what flights you're taking. No boarding pass is required. It's a change the TSA predicts can cut in half the time it takes for an agent to send you on your way. "With this new system, the information is going to be at the instant you present your self at the checkpoint," Pekoske said. "That's what the officer is going to see." New machines similar to medical CAT scan devices that will check your carry on luggage are also coming soon to airports. "It basically presents to the operator a three-dimensional view," Pekoske said. "So, when an operator looks at a carry on bag (they can) turn it around, turn it upside down and slice it." This means fewer passengers will have to wait while agents go through their belongs by hand. "For carry on bags, passengers won't have to take laptops or liquids, aerosols, gels, and food items out of their carry on bags," Pekoske said. "So, that's a big convenience item. That'll make the line go faster." There will also be a camera system to protect the perimeter of the airport and see what's going on over the fence line. "The net result of all of this is a huge improvement in the effectiveness of security," Pekoske said. The new technology is going in at MIA one checkpoint at a time, and Ft. Lauderdale will end up with the updated technology too. Aside from the hardware, Pekoske wanted to thank South Florida, its passengers, restaurants, and vendors at area airports who supported the TSA workers when they showed up for work, at the time, for no pay.